The Urban Politico: Happy Birthday Nelson Mandela! Today the former President of South Africa, Nelson Mandela celebrates his 93rd Birthday. Nelson Mandela has become a global public servant and humanitarian. He is one of the most recognizable faces, in the global fight against AID/HIV. In 1962 Nelson Mandela was arrested and convicted of sabotage along with a collection of other charges. He was sentenced to life and spent 27-years in prison for his work as an anti-apartheid activist. Upon his release from prison in 1990, Mandela worked tirelessly with his party to bring democracy to South Africa. 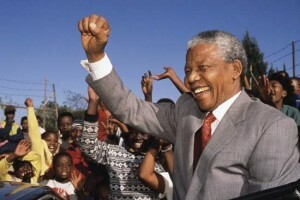 In 1994 with 62% of the vote Nelson Mandela was elected the first black President of South Africa. He served one-term, deciding not to seek reelection and entered retirement in 1999. Nelson Mandela has received over 250 awards for his public service and humanitarian efforts, including the 1993 Noble Peace Prize. In 2009, the United Nations declared July 18th an annual international day of honor – Mandela Day. In tribute of Mandela people around the world will spend 67 minutes engaging in community service.